This year has been an eventful one, a notable one, an extraordinary one. I have been a part of the creation of things, two things, that will last and matter and change the rest of my life. One, an independent film that I helped to write, and shaped in numerous ways beyond that. The other, a child, an infant who I hold now, feeding with one arm as I write this with another. It feels important to point that out; the simultaneous feeding and writing. Because as much as anything else, it is the balance that is impressive: being part of this movie while dealing with a particularly harsh pregnancy, all while maintaining a job and my maternal duties to my first son, and my marriage and all the day-to-day drudgery that one must slog through undeterred while trying to achieve greatness with what’s left of their energy. Juggling, overcoming and prioritizing; that feels like a very female thing. Feeling guilty about those priorities at the end of the day feels even more like one. 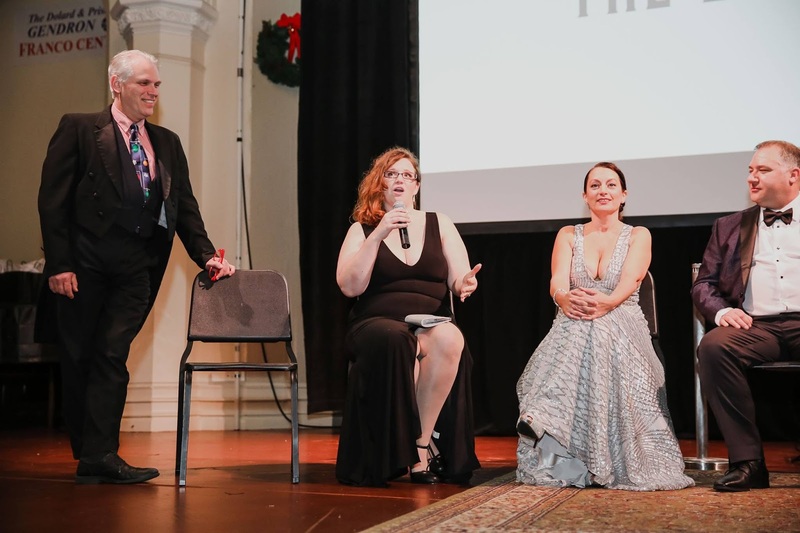 On Friday, the film opened at a black tie gala in a beautiful venue. Despite an untenable level of stress and confusion leading up to it, the evening went off almost without a hitch. It’s worth noting that the film itself was only finished (to the extent it is now, it still requires some editing before the film festival circuit) perilously soon before its first-ever screening. It’s worth noting that while the director was losing sleep getting it finished in time, I was losing sleep helping with details of the night— programs and drink vouchers and gift bags and more— as well as giving him much needed emotional support on a daily, sometimes hourly, basis. Indeed, the night was a celebration not only of the accomplishments of the cast and crew and all of us in creating the film, but also of a smaller, tighter knit group within the group working to make the night itself a success. I was a part of it at every level. It was my night, mine and those beautiful few who have come to mean so much to me. And it’s fitting, I think, that I should start this post about that night, about those accomplishments and the value of them and how truly and deeply I was a part of them. Because, sadly, that’s not what this post is about. This post is about being fat. This is a post about being fat, and having that somehow matter more than everything else, and having that derail one’s feelings of accomplishment and pride with embarrassment and shame. There are pictures of that night, many pictures. In them, I am wearing the dress that I hunted for for months, anticipating that this would be easily among the biggest nights of my life. In them, you can see the makeup that I arranged to have done by the brilliant makeup artist who worked on the movie, and got to the venue three hours ahead of time to have done, though I never wear makeup. In them, you can see all the effort I put forth to look beautiful, because it felt so important to be. These are pictures of me, in a beautiful dress, in a beautiful place. These are pictures of me celebrating one of the greatest accomplishments of my life, standing next to the people I shared it with so intimately, being celebrated by hundreds of people around us. These are pictures I should cherish forever. And I can’t stand to look at them. Still, that's not at the core of it for me, right now. At the core if it, right now, is this sense everything I did leading up to that night was invalidated, for me, by the fact that I didn't look good. I've felt this way dozens of times: planning my first trip to Europe, a lifelong dream of mine, and being terrified to the point of distraction that I would look heavy in the pictures. Worrying about the way my arms would look in my dress for my wedding, rather than being able to simply relish the reality that I was marrying someone who found me beautiful inside and out. Then there's the fact that, in none of these circumstances, did I actually look bad. I looked overweight. It's not that I never have insecurities about my hair or my face or my skin-- I do. But they pale in comparison. I can look back at photos from all of these things and appreciate that I have a pretty smile and sparkling eyes, and usually fair skin. There are people in my life who are dear to me who do not have that, who have very significant insecurities over things that I try not to take for granted-- I think I have a pretty face most of the time, and I try to be grateful for thats. But, there again, when I see a roll of fat captured on film, I lose my ability to keep perspective. Those things are all part of looking good- the hair, the skin, and the figure. So why is it that one trumps the others so entirely for me? I think-- I know-- that the society we live in still shames people for their weight in a way that we don't find it acceptable to shame them for other things. There is this clear sense of fault that we don't associate with someone being short or having poor skin or just being too plain. There has been, of late, some very real progress made in this arena: people fighting for body acceptance for all, and, more importantly, for themselves. It's a movement, and it's gaining speed. There are now pop singers and swimsuit models who are heavier-- maybe not heavy enough, in general, to make the whole world feel included, but for someone like me, who is, I suppose, on the thin side of fat, it makes beauty feel attainable. No matter what I do, I will never be a size two. But with some effort and toning, I could stand alongside the likes of Meghan Trainor and Ashley Graham and not feel out of place. Yet, for all the progress made in people embracing themselves, their is an ever more bitter backlash. Every fat person knows of someone judgmental who claims to be looking out for their health. We have all read hateful comments from people who believe that self-acceptance is a slippery slope to a society full of slovenly behemoths in wheelchairs who eschew any desire for health in exchange for the comparative “ease” of self-acceptance. We've all met people who believe that weight is the very simple exchange of burning more calories than one takes in, and there's nothing more complicated than that-- not genetics. not metabolisms, not a full host of genuine barriers to healthy eating and exercise. There are points I've fought to make-- largely on the behalf of others-- that there's compelling scientific evidence coming out now that shows that losing weight, and maintaining weight loss, is much more challenging than we've ever understood as a society. There is evidence showing that being overweight is not as fundamentally unhealthy as the world would have you believe, and that in many of the markers with which we measure health, overweight people often score higher than thin people. But again, none of these feel like the emotional point that I'm trying to find my way to making. somehow. I suppose the point has something to do with how this movement is important, because, whatever I chose to do with my body, it shouldn't invalidate the way I feel about totally unrelated accomplishments. I co-wrote a movie. I made it great, because I am a great writer. I shouldn't have to qualify that. I should never have to write the sentence, "I am a great writer, but I am fat." I have not always been fat, though I have nearly always been afraid of it. Most of my life, I've been inching slowly towards it, and, due to the genetics of my family, I've been terrified in feeling that it's unavoidable. But I've hovered in that area where I was neither truly fat nor thin for most of my adult life. It wasn't until this latest pregnancy that things took a turn for the unambiguous. Before the pregnancy, I was on ADHD medication that, while helping dramatically with my focus and energy, had the added bonus of controlling my appetite and boosting my metabolism. When I became pregnant and stopped taking the pills, I gained 15 pounds or so almost immediately, well before I normally would have with the growth of the baby. I wasn't able to go back to the medication while pumping breast milk, which I have only recently stopped doing. It's likely that when I get back on this medication, I will lose some weight very quickly. But, since I've also put my body through the rigors of giving birth yet again since then, I suspect it will not be enough to revert to a place of being occasionally mistaken for a thin person. The biggest emotional toll in all of this, for me, is that my self-perception has not adjusted to my outward reality, and I don't think it easily can. When I look in the mirror, I'm able to hold myself in such a way that it hides my biggest insecurities. This is not to say that I feel good looking at myself; I often do not. But nothing can match the gut-wrenching punch of seeing a picture that was a taken from a bad angle, which I suspect many of my angles are. And I have to remind myself, though I wish I didn't, that other people see me from those angles every day. That I have no idea what they're seeing. This is the thing I'm struggling with the most: I do not know what I look like to other people. I'm realizing now that so much of my shame comes from the fact that I continue to act like a thin person, oblivious. The dress I wore was slinky and contoured to my body, which in turn, contoured in ways I quite simply couldn't detect in a mirror. I had every intention of wearing some very powerful shapewear with it, for what's it's worth, but in the hectic struggle of the day, I forgot it at home before getting dressed at the venue. If I'd known what I looked like, I would have made a point to go get it. There's a picture of me standing next to the makeup artist, a girl who has become a close friend. She's heavier than I am. She chose a different style of dress, a gown, and she did so, I presume, because she's used to being heavy. I look at pictures of her and I can only think that she looks amazing. This leads me to the startling conclusion that, at least in part, what I am ashamed of here is not that I am fat, but that I haven't learned to conceal it, to communicate to others that I know that I should. I realize, as I am writing this, that it's not simply that I look fat that bothers me, it's that other people must perceive that I don't realize it-- like the long-term equivalent of having spinach in my teeth-- or that I have instead, chosen to accept it. I have to ask myself, with horror, whether that's the real problem: that I ashamed that I forgot to be adequately ashamed. I believe I should be ashamed of my body, as it is now. I am humiliated when I forget what I look like, and then exhibit confidence that I shouldn't have. I shouldn't have worn a dress that said "look at me." I should have worn a dress that said, "I am a great writer, but I am fat." Which is kind of a lot to ask from a dress. The writer Lindy West, who is well-known in the body acceptance movement, wrote a piece once about coming out as being fat, the way others come out as being gay. Her point was that, for all her life, people acted like it was something too delicate to acknowledge, or a temporary state she was sure to overcome. She wanted to make the point that she'd been fat her whole life, and it wasn't going to change, and maybe it wasn't useful to pretend that it wasn't there. Maybe acknowledging it, and asking her friends and family to acknowledge it, could help with the perception held by herself and others that, despite being wholly obvious, it's something she should try to hide. Part of body acceptance is, well, literally accepting your body. I'm not ready to do that. I'm not ready to call myself beautiful and decide to not be ashamed. I do want to lose weight. I will call my doctor and get my prescription for ADHD meds going again. I will go hungry. I will push myself to exercise too hard, and in moments when that time might be better served on cleaning my house, or writing the next film, or being with my children. But in the interest of coming out as fat-- and, to a lesser degree, in trying to find the value in the night the movie opened, despite my shame-- I will include a picture or two here. For those of you who don't know me, I'm the one in the black. 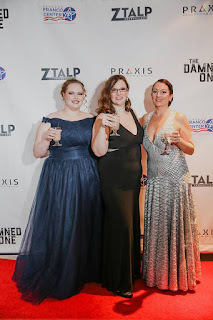 This is a picture of me with two amazing ladies who probably also have body insecurities, but I'm the only one who felt the need to write a damn treatise about it. Here is a picture of me giving an insightful and witty answer to a question in front of hundreds of people, but I am fat. For those of you out there who may have read this, and may be someone who has not struggled with weight, and maybe someone who still has some amount of judgment around overweight people, there are some points I'd like to get across. Number one, I assure you, it is NOT EASIER to just accept yourself than it is to lose weight, though, to be fair, keeping it off may be damn near impossible. But when I look at these pictures and try to imagine a future where I embrace my size and live with confidence and feel good about the tight, revealing dress despite the rolls-- I assure you, I could much more easily go without ever eating another roll in my life, though probably not through healthy means. Number two, and this is a big one: whenever you encourage someone to lose weight, or judge them for it, or make them feel like they're more valuable as a thin person, what you're doing is telling them to reprioritize. You're telling them that the way they look to the world is more important than the things that they're putting their effort into when they're not putting effort into being thin, whether that be their job, their passion, or their family. No one has an infinite amount of energy or time: if you look at someone and determine that the state their body is in is bad for their health, you may very well be discounting the importance to their overall health-- including mental health-- of the things they've chosen over being thin. I like to look at it this way: if someone came up to you and told you that you HAD to learn Chinese you might tell them you're not interested. They might counter with the fact that there's a enormous number of Chinese people in the world, that the future of international business demands it, that we'd live in a more peaceful world if everyone could communicate. And all of their points may be true, but the reality is that learning another language is a huge investment of time and energy. Maybe you'd rather use that time and energy on learning Spanish. Maybe you'd rather use it building a boat. But your priorities are your own, even if that one person judges you. Making the effort to be thin is just one choice people make. There's no moral weight behind the choice either way. My priorities, in the past year, have been largely about this film. They've also been about carrying a healthy baby, and doing a job that helps to support my family, and maintaining my relationships. And I had a baby, and I made a film, and I sacrificed for those things. And I should be proud of them. I should be proud of being a woman who has learned the feminine art of juggling and overcoming. I should fight off the guilt that I have at the end of the day about the choices I made, and realize that my own priorities are valid, whether it's letting my husband watch the kids so that I go and create art, or whether it's having a Little Debbie Brownie at 2 am when I'm woken up for a feeding so that I don't lose my mind from exhaustion and frustration. My choices have reasons behind them, I should embrace them. I should be able to say, I am a worthwhile person. But all I can say right now is "I am a worthwhile person, but I am fat."